Easter Island. Rapa Nui. The very name invites intrigue and mystery. The island is under Chilean sovereignty, where they call it Isla de Pascua (literally: Place Where People Look For Stone Faces). Before we get into the details, let’s cover some logistics. 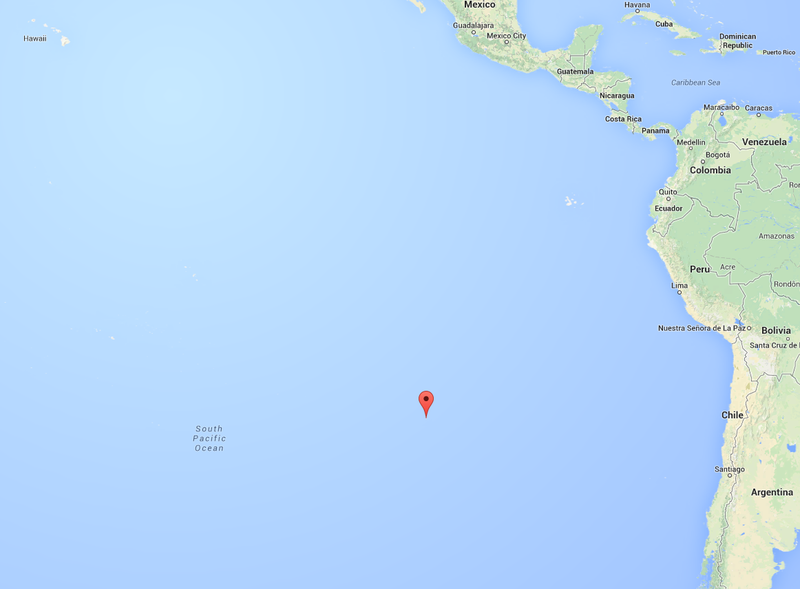 Where the heck is Easter Island? It’s one of the most remote inhabited places on Earth. Quick, think of Santiago, Chile. Ok, now, think of Tahiti. Easter Island is about halfway between the two. Still confused? Let’s try this. 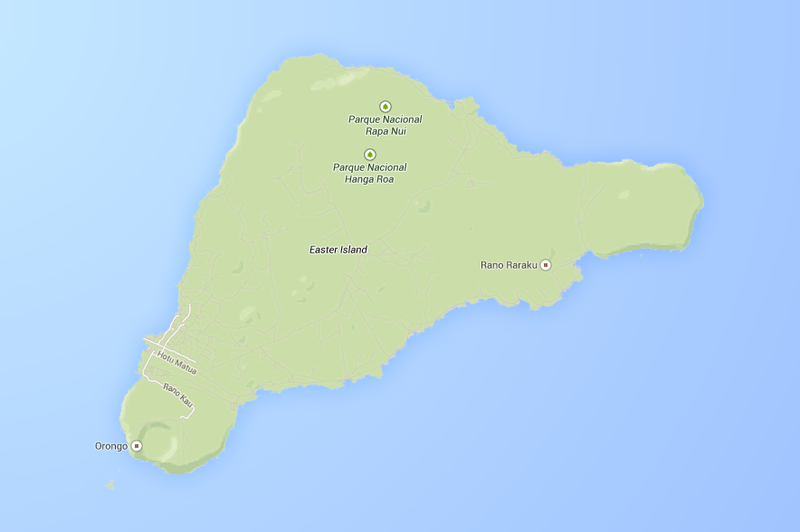 So what makes this island significant? The people are friendly, the scenery is very raw and volcanic, but mainly people come to see these guys. The Moai. A very important part of the religion of the Rapa Nui people, they are found nowhere else on the planet, you have to meet them here. You fly. A lot. On LAN Airlines from Santiago de Chile. Surprisingly there is a great runway on Easter Island, built by none other than NASA. When NASA was planning on landing the Space Shuttle in California, they needed an alternate/emergency runway long enough to handle the Shuttle. Easter Island was pretty close to the optimal flight path, so they came in and built a massive runway in 1971 I believe. This actually works out really well for the modern traveler, as it enabled LAN to fly widebody jets to the island. Therefore, all LAN flights to and from the island are flown by a nice LAN Boeing 767 from Santiago. There’s also a flight from Tahiti to Easter Island, also on LAN. Most people, due to the expense, won’t make it to Easter Island unless they include it on a round-the-world ticket (it’s a very easy stop on the way to New Zealand). Your faithful author, however, found a really cheap airfare. You all know me, even though it was a coach airfare with a ton of stops, I wasn’t going to let it stop me from attempting something incredibly “ambitious” (read: probably dumb)…visiting Easter Island over a long weekend. The trick to this airfare that I found on Flyertalk originated in Mexico City on LAN Airlines, home of (spoiler alert) the most terribly inefficient airport I’ve ever visited. Luckily I was able to find a connecting flight from DFW-MEX on American Airlines for a relatively small increase in cost. What is normally a $1700ish ticket I was able to book for under $500! I know what some of you are thinking, “That looks miserable.” It might surprise you, but you are exactly right. So many flights. However, I was saved by my Priority Pass membership that comes with my American Express Platinum Card. The card has a high annual fee, but trips like this make the benefits worth it, since I was able to visit airport lounges at every stop on my way there. Plus they have Centurion Clubs (open to Amex cardholders) in Mexico City. Not really much to write about here. Every flight, all seven of them, were in coach. The two American flights (to and from MEX) were on domestically-configured S80s and the rest of the flights were on LAN 767s. There was nothing incredibly remarkable about any of the flights once I got used to LAN’s configuration of the 767. They don’t have a middle partition in coach, so you get a really long look down the airplane, which is different from how American configures their 767s. When you’re talking middle partitions as a flight review, you know it’s pretty dull. I tell you what, after a roughly 24 hour journey, being close to Easter Island was pretty awesome. The excitement level rose in the plane (it was filled 90% with tourists), and I looked to my right jealously as those on the right side got the first glance of Easter Island. So, top tip: sit on the right side when flying into Easter Island. We flew around the island once before touching down on Runway number Solamente. No such thing as a jetway, so we stepped out onto stairs from the plane and into a warm, sunny Autumn day. I turned around and grabbed a quick shot of my plane one last time before entering the fantastic world of Rapa Nui.